Replacement headgear for the F&P Eson. The Fisher & Paykel ErgoFit Headgear is included with the F&P Eson Nasal Mask. 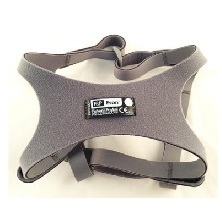 The headgear offers an over the head strap that is designed ergonomically so it “self-locates” on the rear of the head. This allows sideways, up and down head movement without dislodging the headgear. An added feature includes the Easy Clip Hooks for easy and quick headgear and mask removal. The Fisher & Paykel ErgoFit Headgear is included with the F&P Eson Nasal Mask.